These hot summer temperatures are more than uncomfortable, they can be dangerous, especially for seniors. 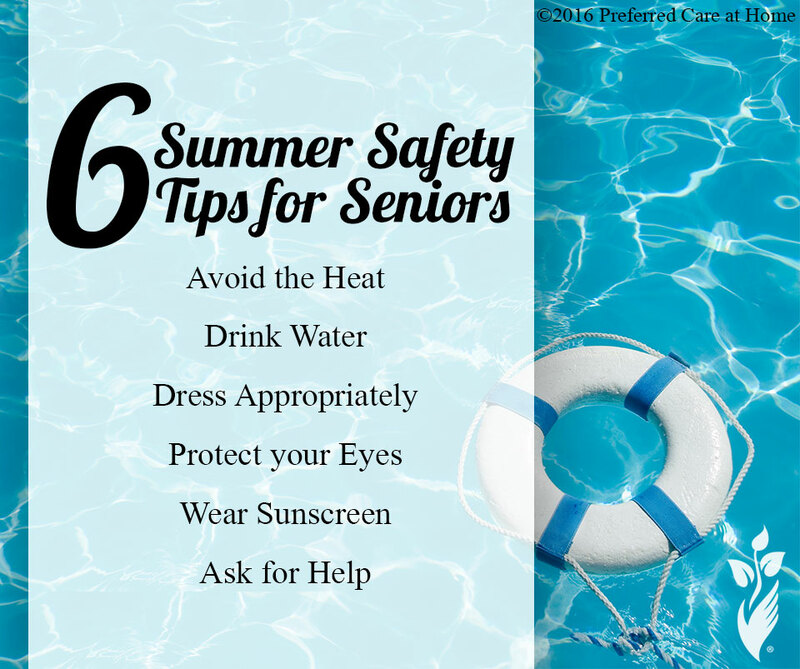 Here are some important summer safety tips for the elderly to beat the heat and thrive this summer. 1. Avoid the Heat. Choose activities and outings that avoid being outside for extended periods of time. Trips to shopping malls, libraries, restaurants, and movie theaters can provide relief from the heat and keep you active throughout the day. 2. Drink water. Staying hydrated is crucial during these hot summer months; and seniors are more at risk of dehydration than younger people due to a variety of reasons such as medication, kidney function, and decreased thirst. This summer make a concerted effort to drink more water. Start keeping track of your water intake to ensure you are getting enough throughout the day. If you are a caregiver of a senior, remind them to drink water and other fluids throughout the day. 3. Dress Appropriately for the Weather. Wear cool, light, and loose-fitting clothing for these hot summer months. If you are planning a trip to the movie theater for example, and are afraid of getting chilly, bring a light-weight sweater instead of wearing heavier clothing. 4. Protect your Eyes. Don’t forget your sunglasses and hat! UV rays can be harmful to your eyes and sunglasses should be worn when you are outside, even if it is cloudy. 5. Wear Sunscreen. Get in the habit of applying sunscreen daily regardless of your scheduled activities. If you are going to be outside for a period of time, be sure to reapply your sunscreen every few hours. 6. Ask for Help. This is the most important of all the summer safety tips. Do not hesitate to ask for help. If your air condition stops working or you start to feel “off”– ask for help! Make an emergency contact list of people that you can call and ask to come check on you. Get to know your neighbors so you can check on them and they can check on you. Don’t mess around with these summer temperatures! Be sure to implement all these necessary summer safety tips. If you find you need help to get through these summer months, contact a senior home care company near you. Our professional caregivers can assist with summer safety precautions so you can enjoy this time of year.